Funny fact about me. When I was dating, I would always insist on sleeping at my house. Why? Because my house has all of my face products! If I was going to sleep at Steve’s house I would pack my toiletry bag, or just go over after I completed my nighttime skin routine. Steve caught on pretty early that I am obsessed with skincare. Now, if I have a wild night and want to just pass out he makes me get up and wash my face because he knows how upset I’ll be in the morning. LOL, I love him. I may be a little extreme with my skincare, but can you blame me? After struggling with acne for so long I made skincare a major priority. If you aren’t a huge skincare fanatic like me, that’s ok! There is just 1 thing you HAVE to do besides sunscreen. I’m always surprised by how many people don’t do it! I know, I know. It’s a hassle and it takes time and effort. But washing your face is the key to a good skincare routine. What is the point of washing your face? Wellllll, let me tell you! It prevents breakouts. The excessive dirt buildup on the skin’s surface can trap oil, sweat, and dead skin cells= ACNE! It enables your expensive products to actually penetrate into your skin. It makes your skin look fresh. It prevents wrinkles! Your skin renews daily, so any residual makeup and dirt on your skin can interfere with the skin’s natural healing process and cellular turnover. With that said, there are some face wash products that even made me not want to wash my face! I’ve tried so many consistencies- oils, foams, creams and just regular foaming wash and I will say, not all face wash is created equal. It doesn’t mean you have to purchase a “designer” face wash that costs upwards of $40. That is just SO unnecessary. Face wash has one job. Clean your skin. Literally, that’s it! So all those “amazing” added ingredients are pointless! It’s on your face for a minute, max, and then you rinse it off. Why not splurge on those products that are actually on your skin for hours? So what do I use? 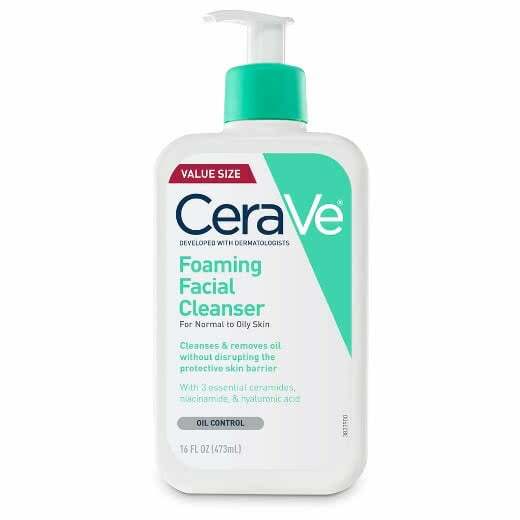 CeraVe Foaming Cleanser! I LOVE this product. It’s definitely a must-have for me. I love how foamy it is. It really gets your makeup off. How to use? Apply a small amount on damp face. Massage gently in circular motion and rinse. I also love how well it works with my Clarisonic. I always dry my face with a new paper towel. Towels harvest bacteria which can cause breakouts. *Make sure you buy the Foaming Cleanser. I’ve tried CeraVe’s Hydrating Facial Cleanser and wasn’t impressed. It’s more of a cream and I felt like I had to use it multiple times in one wash to feel clean. “It’s on your face for a minute max.” …sooo true! How have I not thought of this before? Thank you for sharing. LOVE my Clarisonic! And no joke I use the exact same cleanser lol. This has been my favorite so far. I’ve tried clean and clear before but never see much difference. I find that amazon is also a really good place to find cheap skin care! I’m going to get a Clarisonic ASAP!!! This is the fitting weblog for anyone who needs to find out about this topic. You understand a lot its nearly hard to argue with you (not that I truly would need…HaHa). You undoubtedly put a brand new spin on a topic thats been written about for years. Great stuff, just great! I can’t believe people don’t wash their face!! I actually love the morning burst clean and clear! But I want to try the Cerave!